Feeling So Inspired… Want Some? I’ve been feeling so inspired these last few days, so I thought I’d share the love! This week was the start of my class Roots, in which I’m the teacher AND the student! (Registration for this journey is now closed, but keep an eye out for early registration for our next journey in Sept!) I love playing along with this class, because it’s like a total reset on my practice as we remember how to play and reconnect with our creative spirit. It’s amazing how much our environment affects our creativity! What can you do to create an inviting, dedicated space to create in? I’ve also been experimenting with color alongside my friend Mixy Gregory and her community in her year-long program TWELVTY. Each month we’re exploring a different color, and challenging ourselves to only use that color in our art. The thing that got me the most excited and inspired was the thought of having a full rainbow journal at the end of the journey! 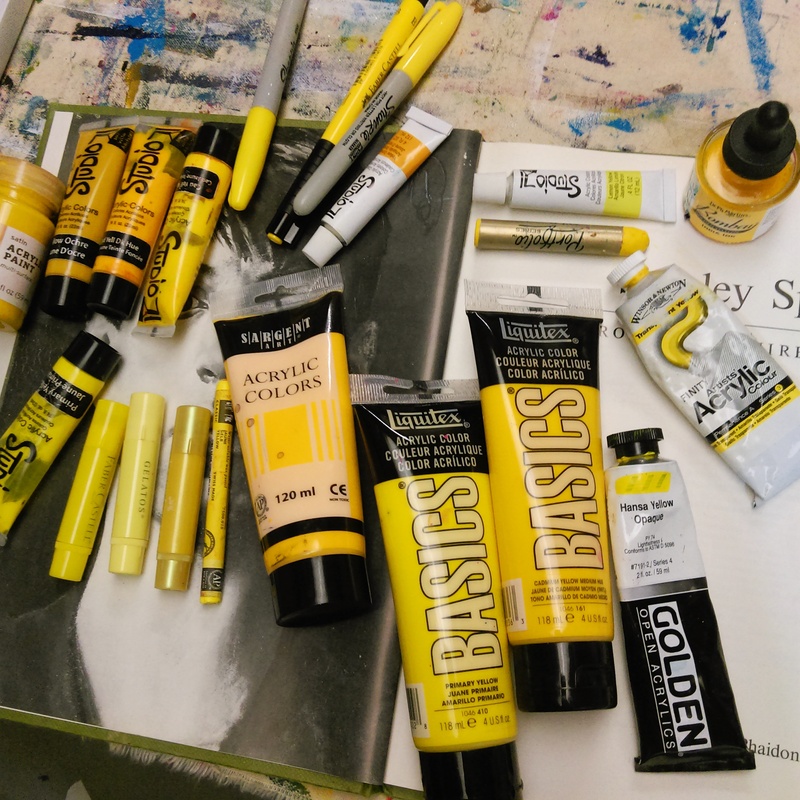 But as I dove into my first experiment with only using the color yellow, I discovered that it’s quite a challenge, and it really stretches your creative muscles! Limiting yourself in some way often stretches your creativity! How can you challenge yourself? Perhaps try using only one or two colors. Or join us in Twelvty to explore the rainbow! If you’d like to join me in Twelvty to learn more about color and explore them with us for a full year, you can SIGN UP HERE! Class has already begun, but Mixy has set up a special page for you to jump in with us! We start playing with green this month! I’m also excited about Connie Solera’s free painting challenge to explore our bodies with art. Each day starting March 6th we explore a certain body part in whatever medium you choose. I think this is going to be so insightful and powerful, not to mention FUN! 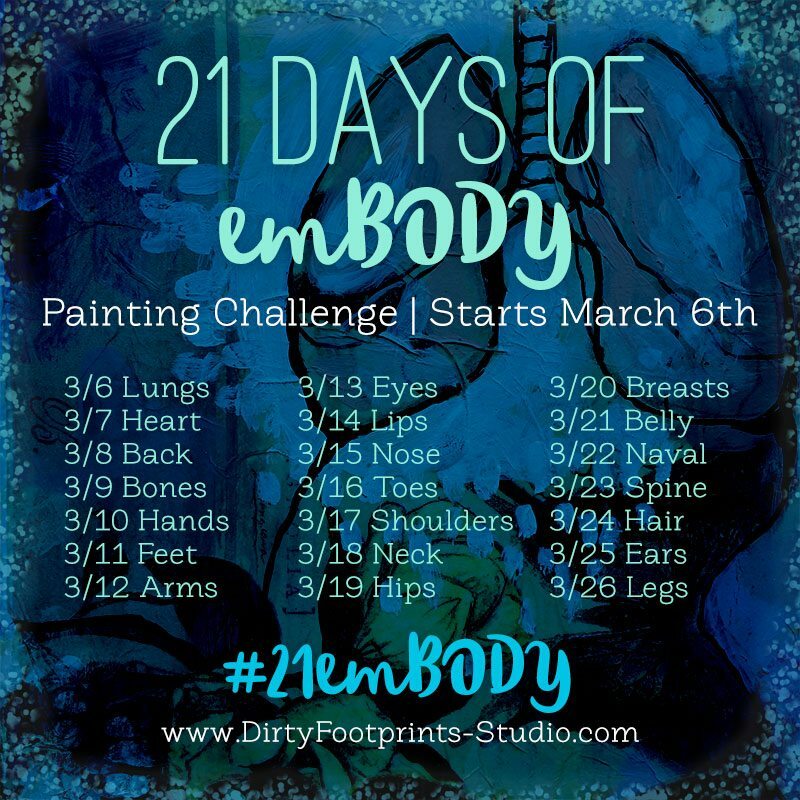 Join in on the challenge by following the prompts on the image here, then share and get inspired with the hashtag #21embody! I hope something here sparks some inspiration for you!! I’m sure you’ve felt by now that learning art techniques simply isn’t all there is to authentically express yourself creatively. There’s something else… something even more important than knowing what colors work well together or how to balance a composition. If you want to discover your own style, if you want to freely express yourself, if you want to live your best life – then it needs to come from your true self, from your soul. Not from your mind, or your fears, or your habitual thoughts. So the key to authentic expression, is not to learn new techniques or find the perfect supply… it’s to practice shifting out of this left-brain head space, and into your heart space. The space where your true, infinitely creative, self can take the lead. This is where your soul speaks to you through intuition. This is where you’ll hear the truth behind those passing critical thoughts. This is where you’ll find your ultimate inspiration. This is where TRUE, authentic expression springs forth. 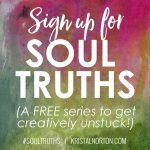 In my guided e-course, Creative Soul Roots, we spend 7 weeks exploring this space where our soul resides, and practicing the art of being present, noticing and moving past our critical thoughts, and listening to our intuition. We dive deep into this process with creative exercises and emerge with a greater understanding of our internal landscape, a stronger relationship with ourselves, and a journaling practice that will ultimately change the way we live our lives. If you’re ready to get past the struggles and critical thoughts, and into the space of free expression, then I invite you to join us. Our journey begins in just a few short days! CLICK HERE to learn more and sign up. Develop a Ritual – Rituals are a beautiful (and fun!) 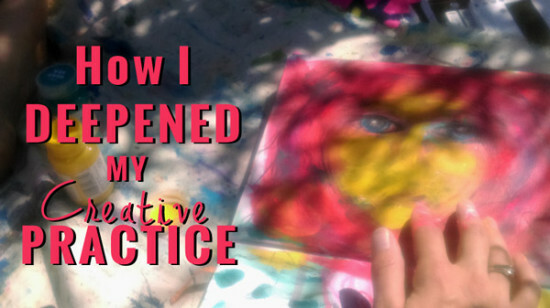 way to awaken your creative, intuitive side before diving into your journal. By practicing a simple activity with intention like lighting candles, putting on an apron, doing some simple stretches, or simply setting up your space, you’re signaling to your brain that it’s time to shift gears. Start with Free-Writing – Sitting down to write freely without censoring yourself is a great way to not only let out all the mind-chatter and junk you have cooped up in that mind, but it’s also a great way to awaken your intuition. Once you get out all that heaviness, a clear channel is then opened up for your intuition to come through and start spilling out onto the page. Move Your Body – Your intuition can only speak to you in the here and now. Body movement can be your ticket to the present moment, as opposed to being stuck in those thoughts of what might happen, or what should happen. Start with a few simple stretches, and/or stand up with your journal on an easel to get your whole body involved in the creating! Entice Your Senses – Using your senses is another fun way to get yourself in the present moment, where you’ll be able to more clearly hear your intuition. Bring in some flowers, drink a glass of wine or a cup of tea, taste some chocolate, focus on the feeling of your brush in your hand, use your fingers to move the paint around, turn up the music, marvel at the colors before you! What else can you use to engage your sense of touch, smell, sight, hearing, and taste? Invoke Play & Curiosity – If you’re stuck in trying to perfect a technique, or create a certain outcome, there’s no room for your soul to shine through. Let all of that go, open up to being vulnerable with not knowing, and play with curiosity! Let yourself be a kid again, simply play with the paints. Get curious: “..what happens if I try this?” Surrender your need to predict or control the outcome and explore with what is right here in the present moment. Practice these, and you’ll be sure to open up new doorways of expression! I haven’t painted anything in over two weeks. What’s wrong with me? Why can’t I get it together? I wonder how she can create so much and still blog and take care of her kids. These are thoughts that used to pass through my mind when I wasn’t creating something. I used to beat myself up for not creating as often as I see others online do. I was caught in the comparison trap and didn’t even know it. Our fast paced society places its value on product – the final result. It’s all about: create, create, produce! It has shaped a vision of what things are “supposed” to look like and it couldn’t be further from the truth. In fact, we have it all wrong. We’re missing the big picture. We’re missing out on the entire process, on the wondrous journey. We are missing out on our lives. There is much more to creativity than just banging out products. It’s full of mysticism, ready to be explored and acknowledged. 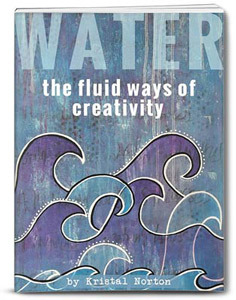 The creative process flows and shifts, like water. It’s not this hard, clean-cut thing. Creativity is not a stone. It takes on many forms. It heals, it transforms, it opens up your heart, it creates a pathway to your intuition… into your soul. This creative source flows through you in more ways than just producing. Ideas incubate, inspiration is gathered, supplies are organized. But even after the creative thinking takes flight and you move into creating, the creative process continues to move through you. The work gets documented, shared, and reflected upon. Each of these phases of the creative process are worthy of recognition. And once I realized this, everything changed for me; I reduced the internal comparison chatter and eased up on the harsh self-judgment. After all: We all have our own way of creating. Turns out, there’s nothing wrong with me, the way I create, or how I produce my work. I enjoy some of the other phases more so than the actual creating because…I’m a gatherer. I love to gather inspiration and research. I can spend months – even years – nurturing an idea. When I honor this, I honor my natural creative process and embrace the creative spirit in all of its fluid ways, releasing the guilt of not creating constantly. Instead, I can confidently move forward, aware that I’m still doing important creative work even when I’m not the producing phase. We are all beautifully unique. Even in how creativity flows through us. When we get intimate with it, we can freely embark on our individual creative journey. 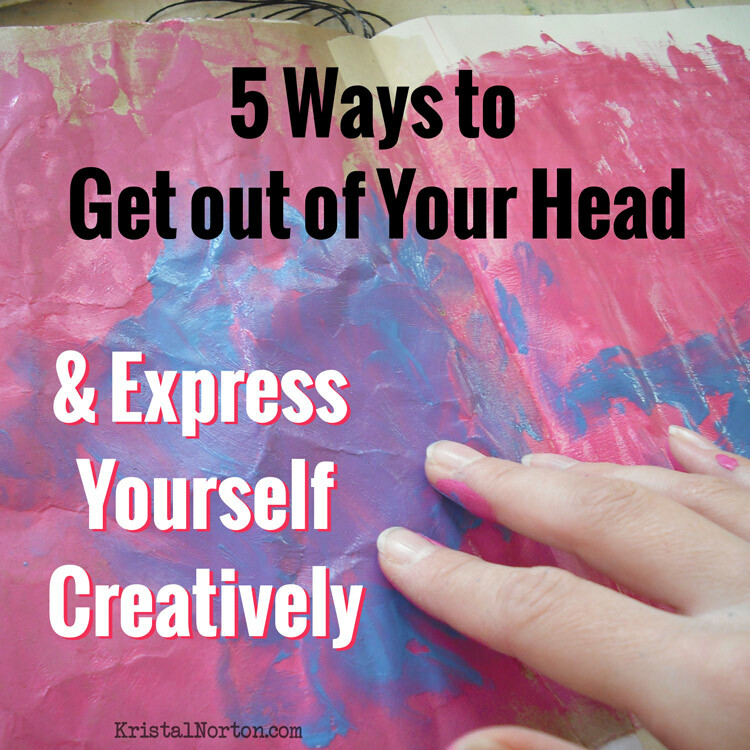 We’ve all heard that creativity can lead to self-discovery, healing, stress reduction, and more. But how? How do you get to that point of being able to create so freely, your soul is able to speak clearly through art? I guess it comes naturally to some. But it wasn’t that so for me. Years ago, I had the need to have a sense of control. I needed life to be predictable. Not only in life, but in my creative process as well. When I created, each step was planned out. And this way of life served me quite well – I built a successful business selling my art, and was even featured in magazines and on television. But it ran me dry. Until eventually I was feeling completely lost and empty. Long story short, I quit and went on a mission for freedom. I floundered, found my way, and floundered some more. Through following my inner guidance, I was able to release some of my perfectionism and comparison and step bravely into art journaling. But it wasn’t until I started working with a life coach that I was able to truly speak to my soul through art. Having my own personal coach, as well as training to sharpen my skills as a life coach has stretched me in so many ways I didn’t know was possible. I had recently moved to a new town. My mother had just passed away. I grew up painfully shy. What I’m really trying to say is – I didn’t have anyone in my life to really talk to. Coaching showed me what it was like to connect with someone on a deep, soul level. It awakened me to how on the surface I was living. It showed me what was possible. It led me to wanting a deeper relationship with others and with myself. And so, the journey of getting to know my soul began. Before life coaching, I didn’t realize how closed down I was. It felt like life was fine. But really, my emotions were shut down. I was still slightly stuck in that “autopilot” way of living. Coaching gently pushed me to open my heart. It gave me a safe space to be vulnerable. 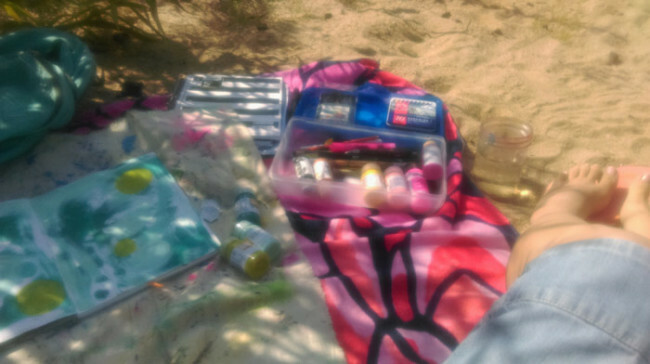 Naturally, it spilled out into my life – beginning with my own safe space: my art journal. From being so closed down, my ego naturally built walls around me – carefully constructed masks of a person I thought society wanted me to be. Coaching helped me begin the process of peeling those layers back one by one; until eventually I started to see who I really am without society’s labels and expectations. Each time I got a glimpse of this beautiful soul within, I let her spill onto my journal page with paint. And the more I saw her, the more easily I was able to connect with her. Changes were happening all around me. Good changes. I began to see the effect coaching was having not only on me, but to my family as well. It taught me the importance of taking time for myself, so I can better serve those I love. With this new understanding, I was able to develop a more regular practice of having personal time with my journal – without the usual guilt. As with any new beginning, my mind was full of negative chatter when I first started art journaling. Ugh, that’s so ugly! You’re doing it wrong! At first, I didn’t even recognize these voices within. I was so used to them playing in the background of my mind, I couldn’t even hear them clearly anymore. All I knew was that I struggled with fully expressing myself. Through working with a life coach, I learned to recognize which voices were coming from my pre-programmed ego, and which were coming from the real me – my soul. In turn, I was finally able to start seeing those negative thoughts as separate from myself. As something I can actually tangibly work with and transform; allowing me to finally let my soul lead the way in life, and in my journal. Through coaching, I was learning to be more present in life. To view myself, others, and the world around me with a new set of eyes. It led me to see how we are all perfectly imperfect. This was especially evident when I began coaching my own clients. I saw how raw, vulnerable, messy, yet oh so beautiful each one of us really are. I fell in love with them not because they were perfect, but because of their imperfections. And through this new view on life, I began to embrace and even love the imperfections in my art. My perfectionism and comparison simply slipped away. Our lives and our art are more intertwined than I ever would have imagined. When beginning my coaching training back in January of 2014, I was simply curious with a passion to help people. But through my journey, I see now the misconception from society that creating is all about producing a result or product. Our creativity is part of our innate magic. It’s a gift we all possess that allows us to weave our souls into the tangible world. It’s bringing our essence to life. It’s making the invisible real – giving it a reality in this tangible, visual world. The more that we can see and nurture our true selves, the deeper our creative practices become. And the deeper our practices become, the more we are able to heal, see, and love our soul – our true beautiful selves. PS Does this sound like a journey you’re ready to embark upon too? For the last two years, I’ve been coaching behind the scenes… But now, I’m ready to offer it to you as well. Click Here to read about my upcoming coaching program “Start a Revolution from within” and sign up to get notified when registration opens.